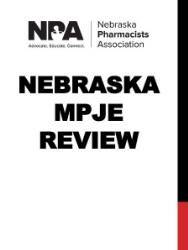 What are the duties of a Pharmacist-In-Charge in Nebraska? Which drugs can be dispensed pursuant to a delegated dispensing permit? Who is subject to mandatory reporting? What information can a pharmacist add or change on a CII prescription? This study guide addresses the objectives as outlined by the National Association of Boards of Pharmacy (NABP). You can review the information at your own pace and assess your learning with the practice questions that are included.